The Pelican range of solids handling pumps are perfect for handling dirty water including sludge and raw sewage or any other fluid containing abrasives or larger solids in suspension up to 60mm Ø. The range offers indefinite dry running with rapid priming. There are no seals or rotating parts in contact with fluid. Pelican pumps require only simple and very occasional maintenance and are supplied with engine and pump operating and instruction manuals. Pelican 251 and 351 are constructed in aluminium with thermoplastic diaphragm and are mounted on a site trolley. 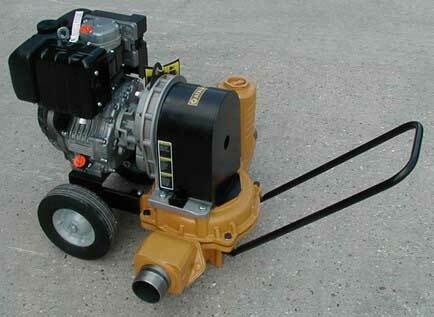 Pelican DLO100 offers cast iron wetted parts with a neoprene diaphragm and is mounted on a site trailer. The Pelican range features a swivel base so the pump can be rotated through 90º for easier access to smaller spaces or through narrow openings. For technical help and advice we recommend visiting our specialist Pump Division. Please add a note to this item once placed in your basket if you would like us to quote for any of the options mentioned in the specifications tab.